So the other day hunger pangs came knocking on my stomach. Not wanting to eat the same old butter toast, I started surveying the refridgerator to cook myself something interesting. While I was frisking things my eyes went on a box of pizza sauce sitting in the side shelf. Instantly a picture of pizza popped over my head. 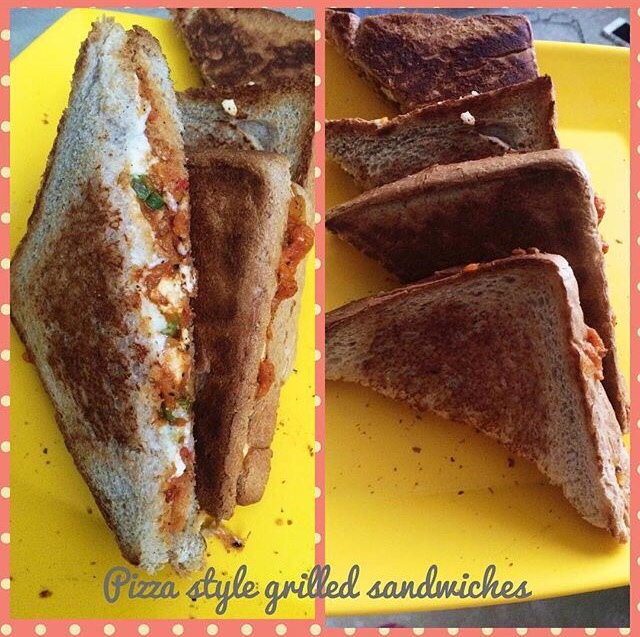 Since there was no pizza base available and I didn't want to do all that baking I thought of creating a sandwich that tastes like pizza and hence this post. Your kids will love this with their glass of milkshake and so will the adults. Put oil in a pan. Add grated tomato and a pinch of salt. When the tomato has reduced almost by half add pizza sauce, ketchup, salt, pepper and oregano. Give it all a good stir. Add capsicum, beans and cottage cheese. Mix well, cook for another minute or two and then take it off the flame and let it cool for a few minutes. Put a pan on the flame. While it gets hot, place a cheese slice on one slice of bread, top it with the sauce and veggie filling and then cover it with another slice of bread. Put a little butter on the pan (optional),and place the sandwich on it. Flip it over to grill the other side. Once both sides are brown, put in a on a plate, slice it in halves or quarters and serve hot. Repeat the same for the other two slices of bread. These sandwiches make a wonderful snack. Try them and leave a comment!